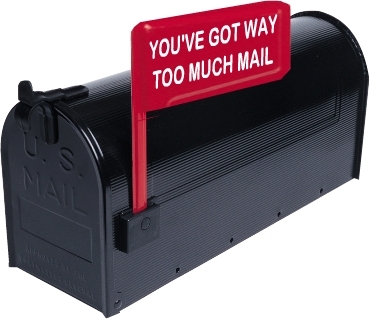 Saying email is dead is rational, understandable, and … dead wrong. Email is here to stay and it is only going to get more, not less, critical to our lives. People spent more time in email in 2010 than any prior year. The next biggest year was 2009. The next biggest was 2008. And so on. And 2011 will certainly be the biggest year for email ever. We are still on a rising trend as mobile devices are accelerating the growth of email. The best proof of email’s continued ascendency is all the profit companies are making from it. Given email is an old technology, it is incredible that there are hundreds of companies that make over $50 MM/year just selling email deliverability services. The Email Service Provider (ESP) space has been growing by 30% per year over the last several years. 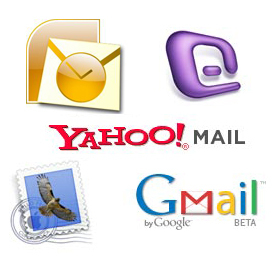 Companies like ConstantContact (NASDAQ: CTCT), Responsys (NASDAQ: MKTG), ExactTarget, MailChimp, VerticalResponse, Blue Sky Factory, iContact, Cheetahmail, Datran’s Stormpost, e-Dialog, Silverpop, Sendgrid, YesMail, Eloqua, and hundreds of others are providing the ability to send billions of emails for millions of businesses. While social media gets all the hype, the combined revenues of all the social media marketers pale in comparison to the boring email companies. And look how email has revolutionized industries. Gilt Groupe – an email list for fashion items – now has a higher valuation than some of the most well known retail brands. GroupOn has revolutionized services by sending them out to deal-seeking consumers via email. And organizations like MoveOn have galvanized hard-core supporters through the simple use of an email list. Even traditional retailers have massively benefitted from email. Companies like the GAP, 1800Flowers, Buy.com, and others generate a huge amount of their revenue (and a larger amount of profit) from emailing their customers and letting them know about special offers and new products. Email marketing is expected to be the top area of investment spending among marketers in 2011. Email drives more revenue than any other medium (even mediums like TV). And email is almost certainly the highest ROI center in marketing. The power of email is that it is asynchronous (the recipient can read it whenever they want), it can be personalized to the user (unlike a Twitter post where everyone reads the same message), it is inexpensive to send (unlike direct mail), free to receive (unlike SMS), it is very trackable, and it is easy to access for almost every American with a wallet. Facebook wall posts aren’t email (they are visible to everyone) but Facebook messages are (they are sent to only a small number of people). While IM is not email because it is meant as a synchronous means of communication, SMSs might become just another form of email (though it will likely continue to have a higher cost). All of us are overwhelmed by our inbox. But information n overload is not confined to email: we’re becoming overloaded with our newsfeed, tweets, LinkedIn stream, SMS messages, RSS feed, and the dozens of other sources being thrown at us every week. There will be more tools in the future to make the experience of using and managing email more enjoyable and more productive … and because of that, I don’t expect to email usage to peak for at least another 15-20 years. None of this means email will stay the same. It won’t. Email is already getting more social, more filterable, more actionable, and more personalized. We’ll see some great strides in email in the coming years and it will continue to evolve and become more important in our lives. This entry was posted in Uncategorized on May 16, 2011 by auren. Just look at the priority inbox on gmail. Now you don’t have to look at the flood of stuff you don’t care about. If facebook did something similar with their news feeds it would bring email and facebook feeds closer together (especially if facebook allowed me to pick which types of wall posts showed up in my news feed and how long they stayed there). Facebook does use an EdgeRank algorithm to prioritize the news feed (hence the “top news” vs the “most recent” toggle at the top). And you can hide various people and types of posts from your feed. Obviously, more could be done, but they have spent some time on these requests. Agree 100%. I love social media, but it’s nice to see that I’m not the only one who’s been thinking this. At some point, the efficacy of email as a delivery tool becomes inadequate and will worsen as agencies of SPAM grow stronger. Very good one Auren. I agree on it 100%, if not ask the BlackBerry guys!!! I know my children will stop being children when they start using their email account. so far just bbm, msn, facebook and twitter. Great argument, and probably true. However, big gap in the argument by not addressing why email use in younger generation is decreasing in favor of texting/social communication. 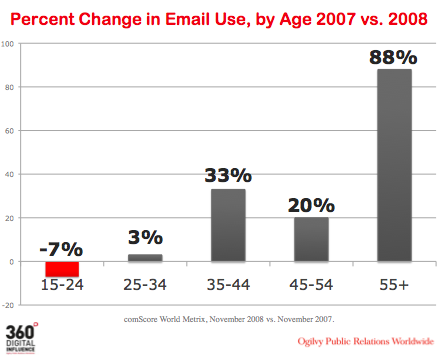 What’s the basis for assuming that as that generation grows, they’ll begin using email more & more? If they don’t, then email use is peaking now, or will peak soon. Great email! It’s interesting how expectations on SMS and IM have become more “semi-synchronous”, where the sender hopes for realtime response, but if they get none it is not weird. Thank you Auren for some good elements of sanity in those discussions about email’s death. The trend is also interesting internationally as well. Working a lot with senior individuals who SMS but don’t email in India. The spam factor and responsiveness is different (as well as SMS being free for the recipient). The side efect is much more spam in SMS. I’m finding I use social networks more because my email contacts aren’t always as updated. However, multiple inboxes are a challenge. It’s interesting that the protocols still define the communication. (Aren’t email and SMS synonymous – the attributes are simply the recipient’s alert settings, devices, and regulatory rate structure?). I read a lot of articles like this lately. I don’t think it’s possible Email to die in the near future. Chad, a valid point you posed but email is required for many situations at least to authenticate passwords of sites where you possibly think the new generation is diverted of. So I feel if spams are controlled, email is still a strong platform and remains for ever. The idea remains but the means might change..accessing it via mobiles, ipads etc..Do you agree?